The omens were propitious.The default weather forecast – showers with sunny spells – sounded as promising as it always does; the temperature was warily nudging double digits; and this being mid-summer, the birds were singing at 4 am and there were cobalt blue streaks in the sky, the end of a long dusk, at 11 pm. Travelling north seemed like a good idea. Belfast had changed considerably from the 1950’s city I had once visited. For many decades, as a frequently returning member of the diaspora, it was out of bounds as a holiday destination. The very name, ‘Belfast’, encapsulated all the worst horrors of ‘The Troubles’, – bombs, riots, bitterness and bloodshed. Yet here we were, on a benign June evening, strolling around in a lively, bustling, dynamic scenario with some impressive 19th architectural monuments to Imperial Britain, (such as the monolithic Town Hall) as an equally benign backdrop. Now it seems the biggest problem in Belfast city is the huge influx of tourists. Infrastructure and service industries are battling to meet the demand. Pubs and the catering industry are rubbing their hands in glee! 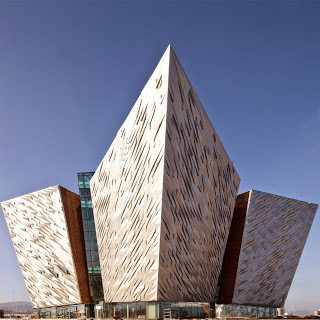 Notwithstanding the close proximity of the ‘Game of Thrones’ studio, the, quite literally, biggest draw card for Belfast as a tourist destination is ‘The Titanic Museum’. The museum is a magnificent structure. It is constructed on Slipway 3 of the (former) Harland and Woolf shipyards, the actual slipway where RMS Titanic was built. (Her sister ship, RMS Olympic, both ships of the highly successful White Star Line, was built and launched at the same time as the Titanic but is much less well known although she was to go on and survive WW2.) The museum building is an innovative, aesthetically beautiful example of modern architecture. It resembles four prows of a mighty ship, or from some angles, seems to be a light filled replica of the Titanic. The four prows are of course based on the actual dimensions of the prow of the Titanic, giving the awed observer an idea of the scale of magnitude of the original. It is an awe-inspiring experience. There are four levels inside the vast structure. The first two levels are given over to a general history of Belfast, from early sea traders to the great shipbuilding and manufacturing industries of the 19th and 20th centuries including a small section devoted to the story of the linen industry. It is very well presented. Large panels with old photos, old newsreels, photos of artifacts, tools etc and short succinct, clear text passages accompanying the exhibits ensure that interest is roused and retained. If anything it is almost too detailed – but that is a minor criticism. 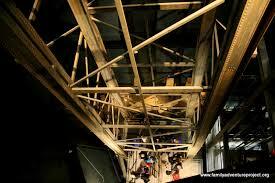 The top levels are devoted to myriad details about RMS Titanic itself. The lift to level three disgorges its human cargo on a gantry-like walkway over a cavernous abyss, which would, in the real Titanic, have housed the boilers, the pumping heart of the mighty vessel. The walkway leads to an electronic dark ride which uses special effects, animations and full scale reproductions to recreate the reality of shipbuilding in the early 1900s. (from the website/The Shipyard Ride). The now, quite scared observer, is strapped into a pod type contraption which in a kind of slow motion ‘dodgem cars’ movement lowers him/her into the middle of the noise, heat and apparent mayhem of the shipbuilding workers in the 1900s. It is a relief to be disgorged again on Level 4 where all you ever wanted to know about the fitting out of the great ships of the White Star Line in general and the Titanic in particular is presented. There are reproductions of cabins, fitted out luxuriously or basically depending on your status and rank, likewise crockery, cutlery and napery. Individuals’ stories, either of survivors or victims are voiced often with accompanying photos. A big screen, creatively blending reproductive with real footage of the actual sinking proved mesmerising. Last but not least, a huge iMax screen brought you into the ghostly undersea world of the actual sunken ship which was only discovered in recent years. By now, coffee beckoned but we were lucky that we got a bite to eat or a table to sit at in the frantically busy café! 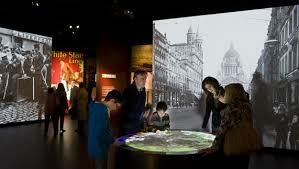 The museum is undoubtedly a huge success and is very productive draw card to bring tourists to the city of Belfast. However enthralling the highly successful Titanic Museum is, it is impossible to spend time in the city and be unaware of the thirty years of ‘The Troubles’. The busy bustling luxury hotel on one of the main thoroughfares was once the most bombed hotel in Europe. Gunman burst into the pub on the opposite corner – now restored to its former art nouveau style – killing many of the innocent patrons. Government buildings – admired for their 19th century architectural style and as emblems of the hugely successful industrial society of the era – were sandbagged and inaccessible only a short two decades ago. There are still random ‘revenge killings’ by members of extremist splinter groups from both sides of the major conflict. And the alliance between the eon-old enemies, brokered by the ‘Good Friday Agreement’ and subsequently endorsed (or not!) by further agreements is fragile, to say the least. While this history is evident in the bustling city centre, it is even more evident in the Falls Rd and Shankill areas of Belfast. It seemed to me that what is most surprising in Belfast is the actual scale of tourist ‘attractions’. The scale of Titanic Museum based on actual dimensions, was awesome. Falls Rd and The Shankill Rd were by comparison, almost underwhelming in their actual size. I had always imagined that these areas were right in the heart of Belfast. They are in fact several kilometers away. It is possible to walk around them in an hour. (They can be covered in two stops of the tour bus!) and impossible to imagine how British tanks rolled inexorably down these narrow suburban streets to hails of sticks, stones or the deadly sound of Kalashnikov weaponry. Now there is just the sound of traffic. The main drawcard here is not the penurious state of the housing and infrastructure and more than likely the population but the many ‘Murals’ which were once used as incitements to violence and bloodshed by one or the other side in the conflict. These huge depictions of the conflict, usually on the sides of a house at the end of a terrace, have been replaced by similarly styled Murals, now used to spread a message of peace and goodwill. There are two Peace Walls devoted to Murals. The one in the (Catholic) area of the Falls Rd features portraits of well-known world heroes of peace, such as Nelson Mandela and Che Guevera. 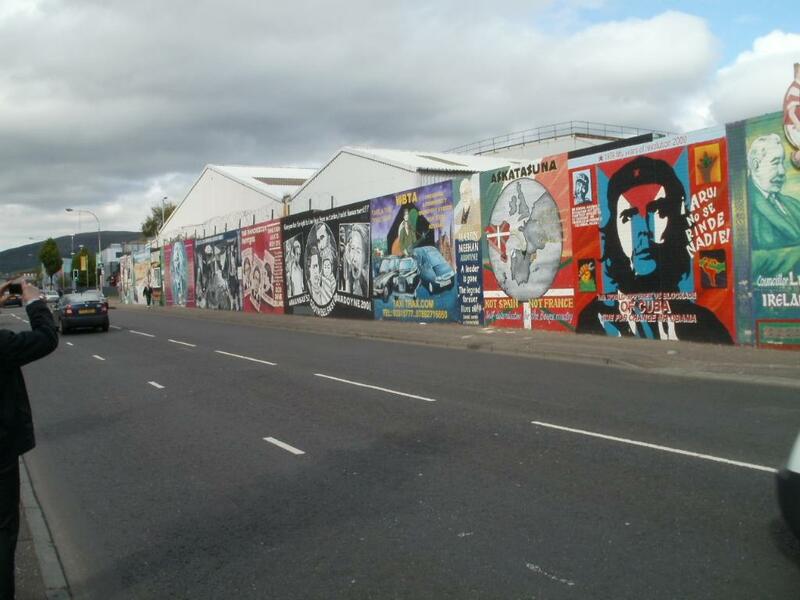 The wall on the Shankill quite literally separates the Catholic and Protestant communities of the area. It is longer and a lot grimmer than the Falls Rd version with much more anarchic murals (although there are several quite beautiful murals there as well.) 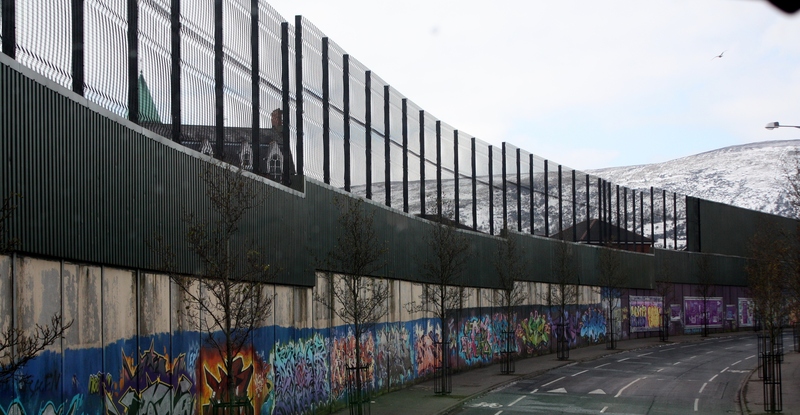 It is topped by barbed wire and appears much more like a prison wall than a peace wall. All efforts to remove it have met with dogged resistance. There are other ominous signs of residual issues from ‘The Troubles’. Two recent high profile documentaries – The BBC’s ‘Panorama’s ‘Britain’s Secret Terror Deals’ and a RTE documentary based on highly-respected journalist Anne Cadwallader’s Lethal Allies: British Collusion in Northern Ireland, indicate that there is some seething unfinished business. The steady stacking of wooden pallets on waste ground sites in preparation for the bonfires which celebrate the defeat of the Catholic King James II by the Protestant William of Orange at the Battle of the Boyne on the 12th July 1688, could also be construed as ominous! Yet the feeling of optimism prevails. There seems to be a determination that Belfast will once again be a prosperous, innovative and forward looking city as it once was in the 19th century – except this time the mighty prow of advancement will include all citizens regardless of religion and the bitter past. Perhaps next time I go there, it will be possible to buy tickets to the spectacle of the bonfires on the ‘Twalft’! 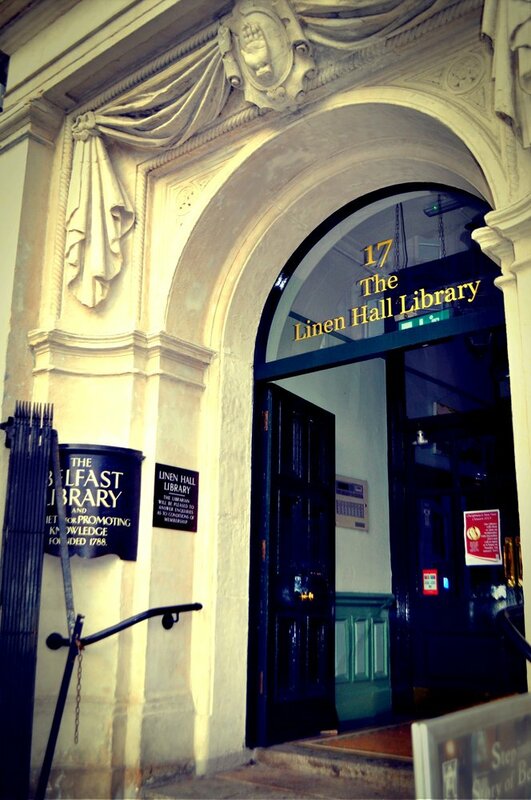 Before we left Belfast for further adventures, we just happened across ‘The Linen Hall Library’. It is to be found in the very heart of Belfast. Up a flight of well worn marble stairs is a substantial library of the history of the linen industry in Belfast –everything you always wanted to know about your Irish Linen tea towel can be found here! As a very pleasant, soothing bonus there was also an exhibition featuring the much beloved 18th century poet and song writer, Thomas Moore of ‘Irish Melodies’ (The Last Rose of Summer/Minstrel Boy/These Endearing Young Charms/etc) fame. The exhibition gallery was a stairwell infused by the light of the late afternoon sun. The information was presented in large poster style format, artistically illustrated with clear, readable text. It was a calm and peaceful moment in the hectic life of a weary traveller. And yes, the purchase of a tea towel from the well stocked gift shop was inevitable! How encouraging to get such a detailed, up-beat picture of Belfast, to so many a bleak, stark and scary town formerly. Thankyou Elizabeth for changing all that in so many beautiful words. Belfast is now a place not to be missed and I would love to see the teatowel you bought and even use it !.